The Pizza Files: And 4 makes 12. Not only have I had 12 pizza's in two days, I made them all. Just for the record I did have seven other pizza eaters help me eat them. A majority of the pizza eaters really liked the olive oil, pancette, basil, fresh mozzarella and shaved parmigiana pizza. I also thought it was very good, but the Margarita (tomato sauce, fresh mozzarella and basil) and the breakfast pizza (olive oil, bacon, cheddar cheese and two eggs) are fighting for my top spot. The next time I eat pizza somebody else will be making it, as I have got the pizza making bug out of my system for awhile. That's the way food was meant to be enjoyed, isn't it? Friends and family around. The whole thing, from preparation to eating is a social event. 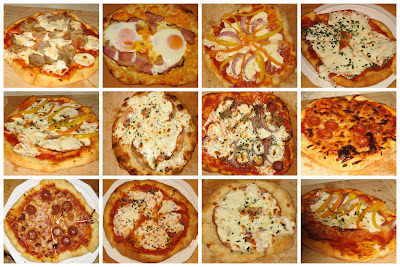 Twelve pizzas in two days is pretty over the top, though! I'd like to try it sometime. I think napkins to catch the drool are a prerequisite for reading this blog. Some of those pizza in the earlier post, especially the top photo with all the cheese look fantastic.